How to Handle the Haters on Social – Cats, Chocolate + Commas. In her book The Zen of Social Media Marketing, author Shama Kabani wrote, “Even if you do get negative feedback, you can turn it into a positive by engaging in a constructive way and showing that you’re a genuine business.” Negative reviews don’t have to make or break a company if it knows how to respond properly. For this week, I will be responding to negative and positive comments from two patrons of two different hotels. NOTE: This is for educational purposes and these are sample posts as if I were the social media manager for these organizations. It is important to reply to both positive and negative comments to show customers and potentials that your company is listening and cares about them. These can also be good opportunities to turn detractors into supporters. 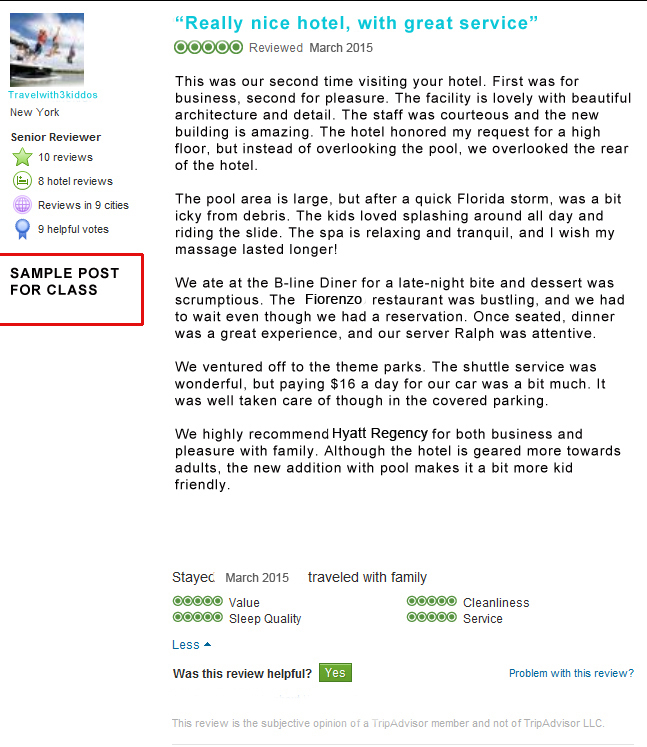 Thank you for taking the time to write a review of our hotel, Travelwith3kiddos! 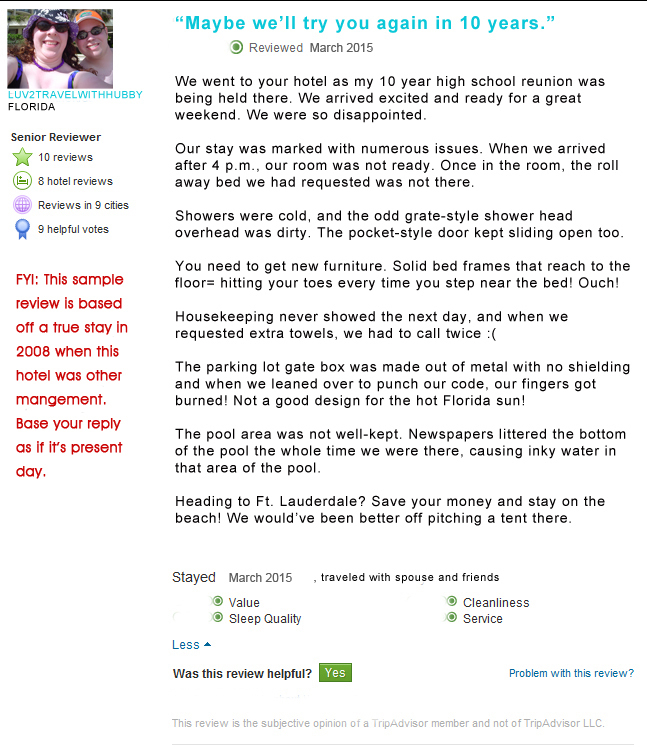 The Hyatt Regency Orlando always appreciates and welcomes feedback from our customers. I am so glad you enjoyed both of your experiences with us, for business and pleasure. For your next stay, we will do our best to accommodate you on an upper floor overlooking the pool. It is wonderful that you were able to relax at our spa (our masseuses are amazing so the time just seems to fly by), while your kids enjoyed our pool and slides. When you come back to our spa, be sure to take advantage of our complimentary gift when you reserve a spa experience in advance and check-in at The Spa at Hyatt Regency Orlando on Facebook. And if you didn’t do so, try the blue velvet cheesecake at the B-Line Diner — berry good. Thanks again, and we look forward to your next visit! – Kristin, social media manager. 1. Respond in a timely manner, if the comment seems to come from a legitimate customer. 2. Don’t be defensive or make excuses. 3. Never create a fake account to come to your company’s defense or delete comments. 3. Own up to mistakes. 4. Take the conversation off of the public forum. 5. Then you can provide an incentive. This information is a bit outdated, but a survey by The Retail Consumer Report in 2011 found that 34 percent of people who received a reply to their negative review deleted it and 33 percent ended up posting a positive review afterward. So responding CAN change the person’s opinion. I would take the conversation off of the public forum so that the hotel could offer the customer an incentive to come back, perhaps a free night’s stay, or offer an upgrade to a suite at no extra charge, and free parking during their visit. This assignment was quite challenging. It is hard to respond to criticism, but looks worse for a company if there’s no response at all. A few things I learned: Be apologetic, if it’s warranted; be sympathetic; and be personal. I give social media managers a lot of credit.